Lip Balms: Eco Lips, Burt's Bees, Quantum Health! POGO Organic Lip Balm: POGO's effective blends provide balanced, fragrant, individual experiences that all lips enjoy. The combination of pureness and effective moisturizers drench lips with the clean, organic essences of vanilla, peach, mint, apricot, berries and bananas. • POGO Organic Lip Balm Apricot Peach? : Apricot peach flavor. With organic hemp seed oil to nurture and protect your lips. 0.15 oz. ORDER NOW! Ingredients: Cera Flava (Beeswax), Helianthus Annuus (Sunflower) Seed Oil, Fair Trade Certified Theobroma Cacao (Cocoa) Seed Butter, Peach Apricot Flavor, Cocos Nucifera (Coconut) Oil, Cannabis Sativa (Hemp) Seed Oil, Mixed Tocopherols (Vitamin E), Rosmarinus Officinalis (Rosemary) Leaf Extract, Calendula Officinalis (Calendula) Flower Extract, Eupatorium Rebaudianum Bertoni (Stevia) Leaf Extract. • POGO Organic Lip Balm Iced Iced Berry: Berry Mint flavor. With organic hemp seed oil to nourish and shield your lips. 0.15 oz. ORDER NOW! Ingredients: Helianthus Annuus (Sunflower) Seed Oil, Cera Flava (Beeswax), Fair Trade Certified Theobroma Cacao (Cocoa) Seed Butter, Berry Flavor, Cocos Nucifera (Coconut) Oil, Cannabis Sativa (Hemp) Seed Oil, Mentha Piperita (Peppermint) Essential Oil, Mixed Tocopherols (Vitamin E), Mentha Spicata (Spearmint) Essential Oil, Rosmarinus Officinalis (Rosemary) Leaf Extract, Calendula Officinalis (Calendula) Flower Extract, Eupatorium Rebaudianum Bertoni (Stevia) Leaf Extract. • POGO Organic Lip Balm Mint Mint: Minty Spice flavor. With organic hemp seed oil to nurture and defend your lips. 0.15 oz. ORDER NOW! Ingredients: Helianthus Annuus (Sunflower) Seed Oil, Cera Flava (Beeswax), Fair Trade Certified Theobroma Cacao (Cocoa) Seed Butter, Cocos Nucifera (Coconut) Oil, Cannabis Sativa (Hemp) Seed Oil, Mentha Piperita (Peppermint) Essential Oil, Mixed Tocopherols (Vitamin E), Rosmarinus Officinalis (Rosemary) Leaf Extract, Mentha Spicata (Spearmint) Essential Oil, Myristica Fragrans (Nutmeg) Essential Oil, Elettaria Cardamomum (Cardamom) Essential Oil, Calendula Officinalis (Calendula) Flower Extract, Eupatorium Rebaudianum Bertoni (Stevia) Leaf Extract. 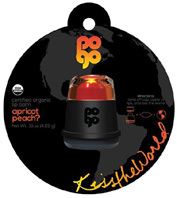 • POGO Organic Lip Balm Nothin' At All: Unscented. With organic hemp seed oil to moisturize and guard your lips. 0.15 oz. ORDER NOW! Ingredients: Helianthus Annuus (Sunflower) Seed Oil, Cera Flava (Beeswax), Fair Trade Certified Theobroma Cacao (Cocoa) Seed Butter, Cocos Nucifera (Coconut) Oil, Cannabis Sativa (Hemp) Seed Oil, Mixed Tocopherols (Vitamin E), Rosmarinus Officinalis (Rosemary) Leaf Extract, Calendula Officinalis (Calendula) Flower Extract. • POGO Organic Lip Balm Split Banana: Banana flavor. With organic hemp seed oil to hydrate and protect your lips. 0.15 oz. ORDER NOW! Ingredients: Cera Flava (Beeswax), Helianthus Annuus (Sunflower) Seed Oil, Fair Trade Certified Theobroma Cacao (Cocoa) Seed Butter, Banana Flavor, Cocos Nucifera (Coconut) Oil, Cannabis Sativa (Hemp) Seed Oil, Mixed Tocopherols (Vitamin E), Rosmarinus Officinalis (Rosemary) Leaf Extract, Calendula Officinalis (Calendula) Flower Extract, Eupatorium Rebaudianum Bertoni (Stevia) Leaf Extract. • POGO Organic Lip Balm True Vanilla Bean: Vanilla Bean flavor. Blended with organic hemp seed oil to nurture and defend your lips. 0.15 oz. ORDER NOW! Ingredients: Cera Flava (Beeswax), Helianthus Annuus (Sunflower) Seed Oil, Fair Trade Certified Theobroma Cacao (Cocoa) Seed Butter, Vanilla Flavor, Cocos Nucifera (Coconut) Oil, Cannabis Sativa (Hemp) Seed Oil, Mixed Tocopherols (Vitamin E), Rosmarinus Officinalis (Rosemary) Leaf Extract, Calendula Officinalis (Calendula) Flower Extract, Eupatorium Rebaudianum Bertoni (Stevia) Leaf Extract. POGO Organic Lip Balm Apricot Peach? LIP BALM: POGO Organic Lip Balm, 0.15 oz. One World Lip Balm: Eco Lips ONE WORLD Lip Balm is made with Cocoa Butter, ingredients and exotic oils from around the globe to offer you exquisitely crafted lip balms with remarkable properties. • One World Lip Balm Renew Rejuvenating (Orange Spice): Go back with this Moroccan anti-aging secret. Made with Argan Oil to help in cell-renewal and combat free radicals that promote to premature aging. Contains antioxidant-rich Vitamin E to recover skin texture. 0.25 oz. ORDER NOW! Ingredients: Theobroma Cacao (Cocoa) Seed Butter, Helianthus Annuus (Sunflower) Seed Oil, Cera Flava (Beeswax), Olea Europaea (Extra Virgin Olive) Oil, Argania Spinosa (Argan) Nut Oil, Citrus Sinensis (Sweet Orange) Oil, Non-GMO Tocopherol (Vitamin E), Foeniculum Vulgare (Fennel) Oil, Elettaria Cardamomum (Cardamom) Oil. • One World Lip Balm Restore Soothing (Coconut Ginger): Made with Tamanu Oil helps restore for severely dry, chapped lips, calms sore lips and supports in the restoration process. Contains emollient Coconut Oil and Cocoa Butter to nurture dry, damaged skin. 0.25 oz. ORDER NOW! Ingredients: Theobroma Cacao (Cocoa) Seed Butter, Cocos Nucifera (Virgin Coconut) Oil, Cera Flava (Beeswax), Helianthus Annuus (Sunflower) Seed Oil, Calophyllum Inophyllum (Tamanu) Seed Oil, Coconut Flavor, Non-GMO Tocopherol (Vitamin E), Citrus Sinensis (Sweet Orange) Oil, Citrus Limonum (Lemon) Peel Oil, Zingiber Officinale (Ginger) Root Oil, Cymbopogon Schoenanthes (Lemongrass) Oilt. • Lip Scrub Vanilla Bean: Exfoliate dry, flaky skin with Organic Sugar and experience the protecting and moisturizing benefits of organic Coconut, Olive Oil and Jojoba. Calming Vanilla Bean leaves you with baby soft, kissable lips! 0.5 oz. ORDER NOW! Ingredients: Fair Trade Certified Sucrose (Sugar), Vanilla Flavor, Ricinus Communis (Castor) Seed Oil, Cera Alba (Beeswax), Cocos Nucifera (Coconut) Oil, Simmondsia Chinensis (Jojoba) Oil, Olea Europaea (Olive) Oil, Mixed Tocopherols (Vitamin E) , Rosmarinus Officinalis (Rosemary) Leaf Extract, Calendula Officinalis (Calendula) Flower Extract, Eupatorium Rebaudianum Bertoni (Stevia) Leaf Extract. LIP BALM: One World Lip Balm, 0.15 oz. 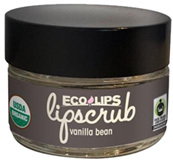 LIP BALM: Lip Scrub Vanilla Bean, 0.5 oz. Eco Tints Lip Balm: Eco Tints hydrate lips and deliver a sheer tint, ideal for work or any time to freshen up. Made with Organic Cocoa Butter, Organic Coconut Oil, Organic Argan Oil and Aloe Vera to help complement with natural earth minerals to offer a silky glide and a stunning sparkling glow. • Eco Tints Lip Balm Rose Quartz: With just a hint more color than the Moonstone, this absolute Rose mineral-tinted lip balm will add a touch of pink to your smile. Ideal for those times you desire a delicate color along with protection and moistness. 0.15 oz. ORDER NOW! Ingredients: Ricinus Communis (Castor) Seed Oil, Cera Alba (Beeswax), Fair Trade Certified™ Theobroma Cacao (Cocoa) Seed Butter, Fair Trade Certified™ Cocos Nuciferas (Coconut) Oil, Vanilla Flavor, Argania Spinosa (Argan) Nut Oil, Mentha Piperita (Peppermint) Oil, Aloe Barbadensis (Aloe Vera) Leaf Oil, Non-GMO Tocopherols (Vitamin E), Titanium Dioxide, Iron Oxide, Mica. • Eco Tints Lip Balm Moonstone: Moonstone is the pure luminescent mineral-tinted lip balm. It provides a elegant natural radiance to your own lip color. Glide some on and set out for a moon dance. 0.15 oz. ORDER NOW! • Eco Tints Lip Balm Sugar Plum: Sheer berry-wine mineral-tinted lip balm is made with an equal amount of both berry and wine. 0.15 oz. ORDER NOW! LIP BALM: Ecotints Moistuirizing Tinted Lip Balm, 0.15 oz. Dagoba Chocolate Lip Balm: The lip balms contain USDA Certified Organic, 100% edible Dagoba® Chocolate and filled with the premium moisturizing goodness of Eco Lips. Enjoy! • Dagoba Chocolate Lip Balm Lavender: The Lavender flavor helps calm you down at bedtime as protection for your lips. Little kids will love it too. Made with organic Cocoa powder and essential oil of Lavender and organic Blueberry flavor. Gluten free. 0.15 oz. ORDER NOW! Ingredients: Helianthus Annuus (Sunflower) Seed Oil, Cera Flava (Beeswax), Fair Trade Certified TM Theobroma Cacao (Cocoa) Seed Butter, Fair Trade Certified TM Cocos Nucifera (Virgin Coconut) Oil, Dagoba TM Theobroma Cacao (Cocoa Powder) Seed, Chocolate Flavor, Blueberry Flavor, Lavandula Angustifolia (Lavender) Essential Oil, Non-GMO Tocopherol (Vitamin E), Calendula Officinalis (Calendula) Flower Extract. • Dagoba Chocolate Lip Balm Mint: Chocolate Mint flavored is made with organic Cocoa powder with a hint of organic essential oil of Peppermint. It provides a fresh, smooth feeling! Gluten free. 0.15 oz. ORDER NOW! Ingredients: Helianthus Annuus (Sunflower) Seed Oil, Cera Flava (Beeswax), Fair Trade Certified TM Theobroma Cacao (Cocoa) Seed Butter, Fair Trade Certified TM Cocos Nuicfera (Virgin Coconut) Oil, Dagoba TM Theobroma Cacao (Cocoa Powder) Seed, Chocolate Flavor, Mentha Piperita (Peppermint) Oil, Non-GMO Tocopherol (Vitamin E), Rosmarinus Officinalis (Rosemary) Oil, Calendula Officinalis (Calendula) Flower Extract. LIP BALM: Dagoba Chocolate Lip Balm, 0.15 oz. Organic Lip Balm: Combined with the premium certified organic ingredients, these lip balms calm and restore chapped lips quickly and will keep your lips moist, soft, and supple! • Organic Lip Balm Bee Free Vegan: Added the lemon-lime flavor in this vegan lip balm. With a candelilla wax base, it is combined with organic Jojoba oil and organic Cocoa Butter to provide your lips amazingly smooth and supple. 0.15 oz. ORDER NOW! Ingredients: Helianthus Annuus (Sunflower) Seed Oil, Euphorbia Cerifera (Candelilla) Wax, Fair Trade Certified TM Theobroma Cacao (Cocoa) Seed Butter, Fair Trade Certified TM Cocos Nucifera (Coconut) Oil, Citrus Limon (Lemon) Peel Oil, Citrus Aurantifolia (Lime) Oil, Non-GMO Tocopherol (Vitamin E), Rosmarinus Officinalis (Rosemary) Leaf Extract, Calendula Officinalis (Calendula) Flower Extract. • Organic Lip Balm Medicinal: The effective herbal blend of organic Tea Tree oil, Camphor, Lemon Balm and Calendula helps in the healing of cold sores. The fragrance of this distinctive blend is calming. 0.15 oz. ORDER NOW! Ingredients: Helianthus Annuus (Sunflower) Seed Oil, Cera Flava (Beeswax), Fair Trade Certified TM *Theobroma Cacao (Cocoa) Seed Butter, Fair Trade Certified TM Cocos Nucifera (Coconut) Oil, Mentha Piperita (Peppermint) Oil, Melaleuca Alternifolia (Tea Tree) Leaf Oil, Melissa Officinalis (Lemon Balm) Leaf Oil, Non-GMO Tocopherol (Vitamin E), Cinnamomum Camphora (Camphor) Oil, Calendula Officinalis (Calendula) Flower Extract. Organic Lip Balm SPF15: Eco Lips SPF Lip Balm is made with organic Sunflower seed oil, organic Beeswax, organic Coconut oil, and Vitamin E to shield your lips under the severest conditions. If your lips go to harsh climates, so does the Lip Balm's protection. May it be sand and surf or icy peaks, the se Lip Balms will safeguard against the sun and retain the moisture in! • Organic Lip Balm SPF15 Berry: Experience the light Berry flavor blended with Aloe to provide you a satisfying and protective feeling. SPF15 UVA/UVB protection. 0.15 oz. ORDER NOW! Active Ingredients: Octinoxate (7.5%), Oxybenzone (3.0%).Inactive Ingredients: Helianthus Annuus (Sunflower) Seed Oil, Cera Flava (Beeswax), Fair Trade Certified TM Theobroma Cacao (Cocoa) Seed Butter, Fair Trade Certified TM Cocos Nucifera (Coconut) Oil, Berry Flavor, Aloe Barbadensis (Aloe Vera) Leaf Oil, Non-GMO Tocopherol (Vitamin E), Rosmarinus Officinalis (Rosemary) Leaf Extract, Calendula Officinalis (Calendula) Flower Extract. • Organic Lip Balm SPF15 Mint: A combination of Peppermint and Spearmint essential oils help calm, rejuvenate and shield. A lip balm trio. SPF15 UVA/UVB protection. 0.15 oz. ORDER NOW! Active Ingredients: Octinoxate (7.5%), Oxybenzone (3.0%). Inactive Ingredients: Helianthus Annuus (Sunflower) Seed Oil, Cera Flava (Beeswax), Fair Trade Certified TM Theobroma Cacao (Cocoa) Seed Butter, Fair Trade Certified TM Cocos Nucifera (Coconut) Oil, Mentha Piperita (Peppermint) Oil, Mentha Spicata (Spearmint) Oil, Aloe Barbadensis (Aloe Vera) Leaf Oil, Non-GMO Tocopherol (Vitamin E), Rosmarinus Officinalis (Rosemary) Leaf Extract, Calendula Officinalis (Calendula) Flower Extract . • Organic Lip Balm SPF30 Sport: A dash of Vanilla is combined into an all-day moisture delight for your lips. SPF30 UVA/UVB protection. 0.15 oz. ORDER NOW! Active Ingredients: Octinoxate (7.5%), Octisalate (5.0%), Oxybenzone (4.0%), Avobenzone (1.0%). Inactive Ingredients: Helianthus Annuus (Sunflower) Seed Oil, Cera Flava (Beeswax), Fair Trade Certified TM Theobroma Cacao (Cocoa) Seed Butter, Fair Trade Certified TM Cocos Nucifera (Coconut) Oil, Vanilla Flavor, Aloe Barbadensis (Aloe Vera) Leaf Oil, Non-GMO Tocopherol (Vitamin E), Calendula Officinalis (Calendula) Flower Extract. • Organic Lip Balm SPF15 Mint Clip: Your lip balm at hand always! Comes with a recycled aluminum Eco Clip carabiner. 0.15 oz. ORDER NOW! Active Ingredients: Octinoxate (7.5%), Oxybenzone (3.0%). Inactive Ingredients: Helianthus Annuus (Sunflower) Seed Oil, Cera Flava (Beeswax), Fair Trade Certified TM Theobroma Cacao (Cocoa) Seed Butter, Fair Trade Certified TM Cocos Nucifera (Coconut) Oil, Mentha Piperita (Peppermint) Oil, Mentha Spicata (Spearmint) Oil, Aloe Barbadensis (Aloe Vera) Leaf Oil, Non-GMO Tocopherol (Vitamin E), Rosmarinus Officinalis (Rosemary) Leaf Extract, Calendula Officinalis (Calendula) Flower Extract. .
• Organic Lip Balm SPF30 Sport Clip: Don't search for your lip balm again, its right at your fingertips! Comes with a recycled aluminum Eco Clip carabiner. 0.15 oz. ORDER NOW! LIP BALM: Organic Lip Balm SPF15, 0.15 oz. • Lip Shines: You get a touch of color with a bit of gloss. Natural, pure color supplemented with hydrating Apricot Wax slides on lips for a sweet and wonderful glossy finish --- leaves your lips gleam as much as your persona. Delivers softening with Sunflower Seed Oil. Ingredients: Ricinus Communis (Castor) Seed Oil, Oleic/Linoleic/Linolenic Polyglycerides, Helianthus Annuus (Sunflower) Seed Oil, Lanolin, Silica, Cera Alba (Beeswax, Cire D'abeille), Acacia Decurrens/Jojoba/Sunflower Seed Cera (Wax, Cire) Polyglyceryl-3 Esters, Aroma (Flavor), Prunus Armeniaca (Apricot) Kernel Oil, Hydrogenated Apricot Kernel Oil, Hydrogenated Apricot Oil Unsaponifiables, Prunus Armeniaca (Apricot) Kernel Oil Unsaponifiables, Butyrospermum Parkii (Shea) Butter, Theobroma Cacao (Cocoa) Seed Butter, Tocopherol, Ammonium Glycyrrhizate, Glycine Soja (Soybean) Oil, Alumina., +/- (May Contain): Ci 75470 (Carmine), Ci 77491, Ci 77492, Ci 77499 (Iron Oxides), Ci 77891 (Titanium Dioxide). • Lip Balm Assorted Superfruit 4-Pack: Lip Balm by Burt's Bees Burt's Bees Assorted Superfruit Lip Balm includes Coconut & Pear, Mango Butter, Pink Grapefruit, and Pomegranate. -- Hydrating Lip Balm with Coconut Oil is combined with juicy, vitamin-rich Pear Extract to offer lips feel soft, moisturized, and healthy all day. -- Nourishing Lip Balm with Mango Butter is blended with Mango Butter to help soften and nurture for dry lips. -- Refreshing Lip Balm with Pink Grapefruit is made with nourishing, tropical Pink Grapefruit Seed Oil is packed with powerful vitamins. -- Replenishing Lip Balm with Pomegranate Oil helps moisturize and rejuvenates your lips for a brilliantly toned appearance. 4 pc. 0.15 oz. Blister box. ORDER NOW! Ingredients: Nourishing Lip Balm with Mango Butter: Helianthus Annuus (Sunflower) Seed Oil, Cocos Nucifera (Coconut) Oil, Cera Alba (Beeswax, Cire D'abeille), Aroma (Flavor), Ricinus Communis (Castor) Seed Oil, Mangifera Indica (Mango) Seed Butter, Llanolin, Ammonium Glycyrrhizinate, Tocopherol, Rosmarinus Officinalis (Rosemary) Leaf Extract, Glycine Soja (Soybean) Oil, Canola Oil (Huile De Colza), Limonene, Linalool. Refreshing Lip Balm With Pink Grapefruit: Helianthus Annuus (Sunflower) Seed Oil, Cocos Nucifera (Coconut) Oil, Cera Alba (Beeswax, Cire D'Abeille), Aroma (Flavor), Ricinus Communis (Castor) Seed Oil, Lanolin, Citrus Paradisi (Grapefruit) Seed Oil, Rosmarinus Officinalis (Rosemary) Leaf Extract, Tocopherol, Ammonium Glycyrrhizate, Canola Oil (Huile De Colza), Glycine Soja (Soybean) Oil, Limonene. Replenishing Lip Balm With Pomegranate Oil: Helianthus Annuus (Sunflower) Seed Oil, Cera Alba (Beeswax, Cire D'Abeille), Cocos Nucifera (Coconut) Oil, Ricinus Communis (Castor) Seed Oil, Lanolin, Aroma (Flavor), Punica Granatum (Pomegranate) Seed Oil, Tocopherol, Rosmarinus Officinalis (Rosemary) Leaf Extract, Glycine Soja (Soybean) Oil, Canola Oil (Huile De Colza), Carmine, Benzyl Salicylate, Cinnamal, Citral, Eugenol, Geraniol, Hydroxycitronellal, Limonene, Linalool. Hydrating Lip Balm With Coconut & Pear: Helianthus Annuus (Sunflower) Seed Oil, Cocos Nucifera (Coconut) Oil, Cera Alba (Beeswax, Cire D'abeille), Aroma (Flavor), Ricinus Communis (Castor) Seed Oil, Butyrospermum Parkii (Shea) Butter, Lanolin, Pyrus Communis (Pear) Fruit Extract, Ammonium Glycyrrhizate, Tocopherol, Glycine Soja (Soybean) Oil, Rosmarinus Officinalis (Rosemary) Leaf Extract, Canola Oil (Huile De Colza), Linalool, Limonene, Geraniol. • Lip Balm Ultra Conditioning Kokum Butter 2-Pack: This ultra-moisturizing Lip conditioner is blended with rich Kokum, Shea, and Cocoa Butters to help nourish skin and clinically proven to provide 4 hours of long-term hydration with one application. Leaves lips feeling soft, supple and healthy. Hypo-allergenic with no added flavors or fragrances. 0.15 oz. Twin pack/Blister Box. USA. ORDER NOW! Ingredients: Cocos Nucifera (Coconut) Oil, Olea Europaea (Olive) Fruit Oil, Helianthus Annuus (Sunflower) Seed Oil, Helianthus Annuus (Sunflower) Seed Wax, Persea Gratissima (Avocado) Oil, Olus (Vegetable Oil, Huile Vegetale) Cera Alba (Beeswax, Cire D'abeille), Sclerocarya Birrea Seed Oil, Soybean Glycerides, Theobroma Cacao (Cocoa) Seed Butter, Garcinia Indica Seed Butter*, Butyrospermum Parkii (Shea) Butter Butyrospermum Parkii (Shea Butter) Unsaponifiables, Cymbopogon Martini Oil, Citrus Aurantium Dulcis (Orange) Oil, Salvia Sclarea (Clary) Oil, Tocopherol, Myroxylon Pereirae (Balsam Peru) Oil, Vanilla Planifolia Fruit Extract Illicium Verum (Anise) Fruit/Seed Oil, Cananga Odorata Flower Oil, Glycine Soja (Soybean) Oil, Citric Acid, Geraniol, Linalool, Benzyl Benzoate. • Lip Balm Mango Butter 2-Pack: Nourishing Mango Butter Lip Balm is blended with natural emollient Mango Butter to help provide your lips a taste of the tropics with this exotic butter extracted from the seeds of the Manifera Indica (Mango) tree. Helps soften and nurture for moisturized lips. 0.15 oz. Twin pack/Blister Box. USA. ORDER NOW! Ingredients: Helianthus Annuus (Sunflower) Seed Oil, Cocos Nucifera (Coconut) Oil, Cera Alba (Beeswax, Cire D'abeille), Aroma (Flavor), Ricinus Communis (Castor) Seed Oil, Mangifera Indica (Mango) Seed Butter, Llanolin, Ammonium Glycyrrhizinate, Tocopherol, Rosmarinus Officinalis (Rosemary) Leaf Extract, Glycine Soja (Soybean) Oil, Canola Oil (Huile De Colza), Limonene, Linalool. • Lip Balm Pink Grapefruit 2-Pack: This luscious Lip Balm helps nurture with powerful Vitamin C and E from Pink Grapefruit Seed Oil. Rejuvenate your tired lips with a sweet hint of delicious Citrus. Leave lips soft and conditioned. 0.15 oz. Twin pack/Blister Box. USA. ORDER NOW! Ingredients: Helianthus Annuus (Sunflower) Seed Oil, Cocos Nucifera (Coconut) Oil, Cera Alba (Beeswax, Cire D'abeille), Aroma (Flavor), Ricinus Communis (Castor) Seed Oil, Lanolin, Citrus Paradisi (Grapefruit) Seed Oilrosmarinus Officinalis (Rosemary) Leaf Extract, Tocopherol, Ammonium Glycyrrhizate, Canola Oil (Huile De Colza), Glycine Soja (Soybean) Oil, Limonene. LIP BALM: Lip Balm 2-Pack, 0.15 oz. LIP BALM: Lip Balm 2-Pack, Mango ButteR 0.15 oz. • Lip Shimmers: Extend an embrace of radiant color with the delicious Lip Shimmers. Made with Shea Butter, Vitamin E, Beeswax and Sunflower Oils to help hydrate, nurture and soften lips naturally and tenderly. Refreshes with Peppermint flavor. • Lip Shimmer Peony:0.09 oz. USA. ORDER NOW! • Lip Shimmer Caramel:0.09 oz. USA. ORDER NOW! • Lip Shimmer Guava: 0.09 oz. USA. ORDER NOW! • Lip Shimmer Watermelon: 0.09 oz. USA. ORDER NOW! • Lip Shimmer Rhubarb: 0.09 oz. USA. ORDER NOW! • Lip Shimmer Fig: 0.09 oz. USA. ORDER NOW! Ingredients: Ricinus Communis (Castor) Seed Oil, Helianthus Annuus (Sunflower) Seed Oil, Beeswax, Euphorbia Cerifera Wax, Mentha Piperita (Peppermint) Oil, Lanolin, Theobroma Cacao (Cocoa) Seed Butter, Copernicia Cerifera Wax, Butyrospermum Parkii (Shea) Butter, Fragaria Ananassa (Strawberry) Seed Oil, Prunus Armeniaca Apricot) Kernel Oil, Ribes Nigrum Black Currant) Seed Oil, Rosmarinus Officinalis (Rosemary) Leaf Extract, Sambucus Nigra (Elderberry) Seed Oil, Tocopherol, Canola Oil, Glycine Soja (Soybean) Oil. +/-: Mica, Iron Oxides, Carmine, Alumina, Titanium Dioxide. LIP BALM: Lip Shimmer, 0.09 oz. Lip Balm Beeswax: The original and absolute Beeswax Lip Balm is made with Beeswax to help condition skin and antioxidant Vitamin E hydrates. Blended with Peppermint Oil to offer a revitalizing tingle. Leaves soft and smooth lips. • Lip Balm Beeswax Tube: 0.15 oz. Tube. USA. ORDER NOW! • Lip Balm Beeswax Tin: 0.3 oz. Tin. USA. ORDER NOW! • Replenishing Lip Balm Pomegranate: Replenishing Lip Balm is made with antioxidant-rich Pomegranate Oil. 100% natural, it abundantly moisturizes and rejuvenates your lips with a touch of color for a smooth, exquisitely toned appearance. Sweet Pomegranate flavor. 0.15 oz. Tube. USA. ORDER NOW! Ingredients: Helianthus Annuus (Sunflower) Seed Oil, Cera Alba (Beeswax, Cire D'abeille), Cocos Nucifera (Coconut) Oil, Ricinus Communis (Castor) Seed Oil, Lanolin, Aroma (Flavor), Punica Granatum (Pomegranate) Seed Oil, Tocopherolrosmarinus Officinalis (Rosemary) Leaf Extract, Glycine Soja (Soybean) Oil, Canola Oil (Huile De Colza), Carmine, Benzyl Salicylate, Cinnamal, Citral, Eugenol, Geraniol, Hydroxycitronellal, Limonene, Linalool. • Lip Balm Honey: This natural Honey Lip Balm helps nurture your dry lips with a touch of golden Honey and Vitamin E, leaving them soft, smooth and healthy. Refreshingly sweet Honey flavor. 0.15 oz. Tube. USA. ORDER NOW! Ingredients: Helianthus Annuus (Sunflower) Seed Oil, Cocos Nucifera (Coconut) Oil, Lanolin, Aroma (Flavor)*, Mel (Honey, Miel), Tocopherol, Rosmarinus Officinalis (Rosemary) Leaf Extract, Glycine Soja (Soybean) Oilcanola Oil (Huile De Colza), Benzyl Benzoate, Coumarin. • Rejuvenating Lip Balm Acai Berry: Rejuvenating Lip Balm with Acai­ Berry is blended with Acaí Berry for a healthy combination of Vitamins A, C, D, and E, antioxidants and moisturizing Omega Oils. A 100% natural lip balm helps to beautify and invigorate your pretty lips. Sweet tropical flavor 0.15 oz. Tube. USA. ORDER NOW! Ingredients: Helianthus Annuus (Sunflower) Seed Oil, Cocos Nucifera (Coconut) Oil, Cera Alba (Beeswax, Cire D'abeille), Aroma (Flavor), Ricinus Communis (Castor) Seed Oil, Lanolin, Euterpe Oleracea Fruit Oil, Ammonium Glycyrrhizinaterosmarinus Officinalis (Rosemary) Leaf Extract, Tocopherol, Glycine Soja (Soybean) Oil, Canola Oil (Huile De Colza), Anise Alcohol, Benzyl Benzoate, Benzyl Cinnamate, Citral, Farnesol, Limonene, Linalool. LIP BALM: Beeswax Lip Balm, 0.15 oz. LIP BALM: Lip Balm, 0.15 oz. LIP BALM: Lip Balm, Rejuvenating Acai Berry 0.15 oz. • Moisturizing Lip Balm Wild Cherry: Moisturizing Lip Balm is combined with rich Cherry oil, Beeswax, and Coconut Oil helps moisturize and rejuvenate dry lips. Lip Balm's sweet, natural flavor with just a touch of tartness will revitalize your senses and treat your lips. 0.15 oz. Tube. USA. ORDER NOW! • Revitalizing Lip Balm Blueberry & Dark Chocolate: Revitalizing Lip Balm is blended with Blueberry Seed Oil and Cocoa Powder, and conditioning Cocoa Seed Butter. Blended with 100% natural butters and oils to restore and reveal beautiful, soft, healthy-looking lips. 0.15 oz. Tube. USA. ORDER NOW! Ingredients: Helianthus Annuus (Sunflower) Seed Oil, Cocos Nucifera (Coconut) Oil, Cera Akba (Beeswax, Cire D'abeille), Aroma (Flavor), Ricinus Communis (Castor) Seed Oil, Lanolin, Theobroma Cacao (Cocoa) Seed Butter, Vaccinium Corymbosum (Blueberry) Seed Oil, Theobroma Cacao (Cocoa) Fruit Powder, Ammonium Glycyrrhizate, Tocopherol, Rosmarinus Officinalis (Rosemary) Leaf Extract, Canola Oil (Huile De Colza), Glycine Soja (Soybean) Oil, Benzyl Alcohol, Eugenol, Geraniol, Limonene, Linalool. • Refreshing Lip Balm Pink Grapefruit: This luscious Refreshing Lip Balm is blended with nourishing, tropical Pink Grapefruit Seed Oil, packed with powerful Vitamin C and E. Relaxes and softens lips. Delightful Citrus flavor. 2014 Martha Stewart Weddings Bridal Award Winner. 0.15 oz. Tube. USA. ORDER NOW! Super Lysine + Cold Sore Treatment: Super Lysine + brings fast relief from the pain, tingling and blisters, and stops burning and itching. Helps clear up your cold sore in half the time. Its soothing formula moisturizes as it works. Super Lysine+ Ointment is made with 14 nutrients including Lysine, Propolis, Olive Oil, Vitamin E and more! 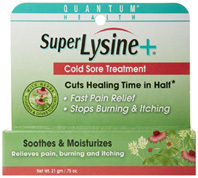 • Super Lysine + Cold Sore Treatment: 0.25 oz. USA. ORDER NOW! 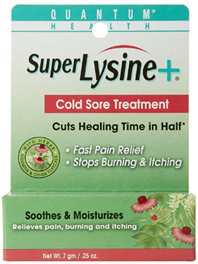 • Super Lysine + Cold Sore Treatment:0.75 oz. USA. ORDER NOW! Active Ingredient: Menthol 0.1%. Inactive Ingredients: Beeswax, Calendula Officinalis Extract, Echinacea Angustifolia Extract, Gum Benzoin Tincture, Honey Hydrastis Canadensis (Goldenseal), Lysine, Melaleuca Alternifolia Oil, Melaleuca Cajuputi Oil, Olea Europaea (Olive) Fruit Oil, Propolis Extract, Vitamin A (Retinyl Palmitate), Vitamin D2, Vitamin E (Tocopherol), Zinc Oxide. 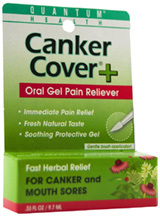 • Canker Cover+ Oral Gel Pain Reliever: For the temporary relief of pain associated with canker sores, toothache, dentures, braces or cheek bites. Canker Cover + works by forming a protective gel over the mouth sore. Menthol and clove oils numb the sore and provide pain relief. Made with 16 nutrients including Lysine, Licorice, Aloe Vera, Porpolis and Tea Tree Oil. Comes with a soft brush to make application on tender mouth sores pain-free. 0.33 oz. USA. ORDER NOW! Active Ingredients: Menthol 0.5%. Inactive Ingredients: Aloe Barbadensis Leaf Juice (Aloe Vera Gel), Calendula Officinalis Extract, Cellulose Gum, Commiphora Myrrha (Myrrh) Extract, Cyanocobalamin (Vitamin B12), Dipotassium Glyrrhizinate (DGL, Licorice), Echinacea Purpurea Extract, Eugenia Ceryophyllus (Clove Bud) Oil, Glycerine, Hydrastis Canadensis (Goldenseal) Root Extract, Lysine, Melaleuca Alternifolia (Tea Tree) Oil, Melaleuca Leucadendron (Cljuputi) Oil, Mentha Piperita (Peppermint) Oil, Castor Oil, Polysorbate 20, Propolis Extract, Purified Water, Zinc Gluconate. 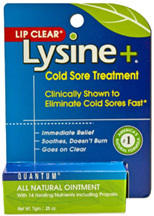 • Lip Clear Lysine+ Cold Sore Treatment: Lip Clear Lysine+ Ointment helps reduce the healing time of cold sores by half. With calming, moisturizing action that stops pain on contact, Lip Clear Lysine+ is the leading and most effective herbal nutrient ointment available. More immediate relief from the pain of cold sores. 0.25 oz. Tube. USA. ORDER NOW! Super Lysine + Cold Sore Treatment 0.25 oz. Super Lysine + Cold Sore Treatment 0.75 oz. LIP BALM: Super Lysine + Cold Sore Treatment, 0.25 oz. LIP BALM: Super Lysine + Cold Sore Treatment, 0.75 oz. LIP BALM: Canker Cover + Oral Gel Pain Reliever, 0.33 oz. Lip Clear Lysine+ Cold Sore Treatment, 0.25 oz. • Lip Balm Sweet Violet: Relaxing effects on the skin, both Sweet Violet and Burdock are refreshing and enjoyably sweetened with Stevia and Anise. 0.15 oz. ORDER NOW! Ingredients: Olive Oil, Beeswax, Comfrey Root, Violet Leaf, Burdock Leaf, Stevia, Orris Root and Anise Essential Oils, and Vitamin E.
• Lip Balm Holy Basil: Holy Basil is known to have stress relieving, focusing, and harmonizing effects. Pleasantly invigorating and amazingly spicy. 0.15 oz. ORDER NOW! Ingredients: Olive Oil, Beeswax, Comfrey Root, Holy Basil, Holy Basil Essential Oil, Vitamin E.
• Lip Balm Calendula Orange: Delight your chapped lips with Organic Calendula. Recognized for its effective skin benefits, supplemented the sunny Citrus flavor. 0.15 oz. ORDER NOW! Ingredients: Olive Oil, Beeswax, Comfrey Root, Calendula, Orange Essential Oil, and Vitamin E.